Scoop Mason is a radio reporter for the World Press News. He operates when first we meet him in the Europe of the recently invaded France as the German army sweeps in from Belgium and the Gestapo begins its iron reign on the citizenry. Mason is assisted by what appears to be a British valet, certainly by his dress and his omnipresent derby hat, though his dialogue is far more American with phrases like "bump you off" and "holy whiskers!". The man goes by the name Sleepy Samson (in a later adventure, though, Samson is shown in a plaid suit with a polka-dot bowtie wearing a much larger floppy hat so it is hard to say where he is from). This intrepid war correspondent is involved in a rivalry with a female fellow reporter named Judy Jackson, known to Scoop and others as Jay Jay. Their competition has been ongoing for some time; as Samson mentions early one that she's "been in our hair from Ethiopia to Shanghai". Such an itenerary clearly shows that both she and Mason have a globe-spanning beat. As is Mason, she is not only a reporter but also a radio personality broadcasting her reports to the people back home in America. At times it looks like both Mason and Jay Jay are print reporters but other times they clearly are shown standing before a broadcast microphone sending the stories out on the airways. It is likely, then, that they each are both, reaching their audiences back in the States in two different mediums. Mason is without a doubt a globe-trotting adventure seeker as he clearly enjoys the dangerous assignments and the rush he gets from them. He also, it is learned towards the end of the 6-adventure series, is in the U.S. Naval Reserve and works on occasion for Naval Intelligence. He is quite handsome, dashing in his dress and style. He is a blond with medium length hair, clean shaven, and he always seems ready to leap at the next moment into some scrape or another. His apparent soul-mate and archrival, is just like him except for being dark haired. They make a great almost team. 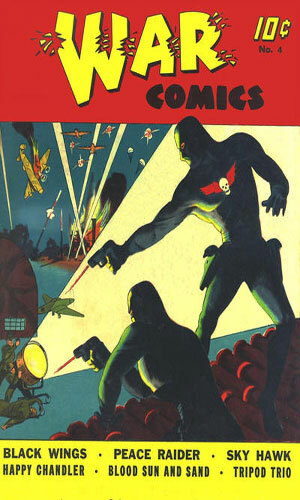 From War Comics #1 - Looking into the destruction of munitions factories in France, Scoop Mason and Samson uncover a sabotage operation that includes the owner of several of the factories. 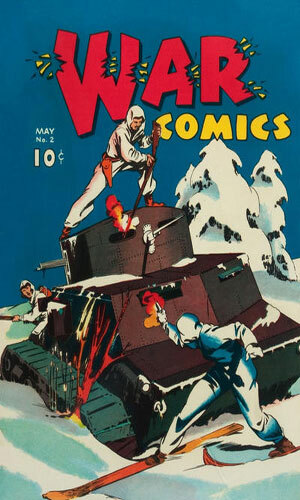 From War Comics #2 - Out to prove that Baron Treville, the munitions dealer, was double-dealing by selling to both sides and often with dud armament, Scoop Mason and Sleepy Samson sneak into Germany in the back of a convoy truck. 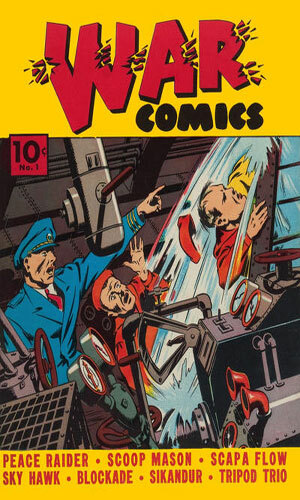 From War Comics #3 - Learning their rival, Jay Jay, has managed to get into Russia via Finland, Scoop Mason and Samson head there as well to learn what story she is following. A Russian agent does not want them to arrive alive. 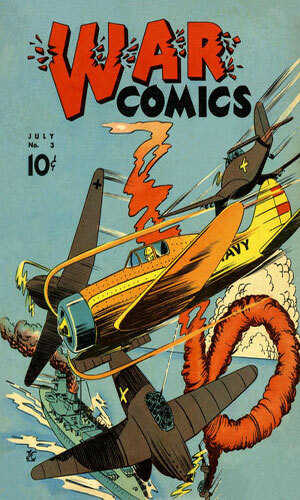 From War Comics #4 - A very multi-national adventure. German agents hijack a Japanese submarine to use it to attack America to start a war between the US and Japan (if only they knew!). They are going to attack a US cargo ship hauling supplies to Russia. Jay Jay learns of German spies in Honolulu and leaves a date with Scoop Mason which just makes him very curious. 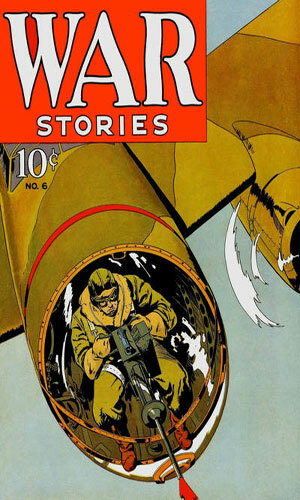 From War Stories #5 - Scoop Mason and Sleepy are in the Azores where Mason, still in the Naval Reserves, is due to be stationed aboard a destroyer. He hopes for one more story before his departure and thinks the hotel fire with the cindered corpse might be it. The real story comes onboard the naval vessel. 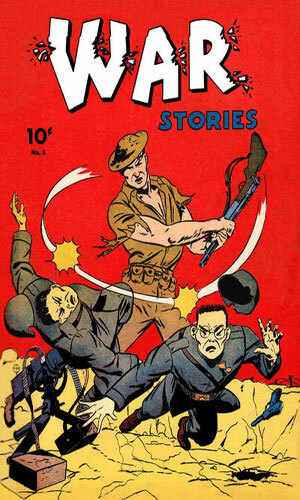 From War Stories #6 - Scoop Mason is keeping busy in the Far East where he is reporting for a news syndicate, working with US Naval Intelligence, and trying to keep a step ahead of his rival and love, Jay Jay. She saves a woman who claims to be in Chinese Intelligence but is really a Japanese spy. Given 8 pages per adventure, this short-run series was really quite good for its time. Most of its contemporaries were trying, largely unsuccessfully, to craft a tale in 4 pages. The added pages definitely gave the writer(s) a chance to expand the tale and put some meat into it. The addition of Sleepy Samson seems sort of a "must do" as buddy tales were so common (need someone to explain things to, you know). Putting in Jay Jay as a rival as well as a love interest was a terrific idea, though. I paused to wonder after reading the fourth tale what the author must have thought a few short months later when Japan attacked the U.S. at Pearl Harbor.